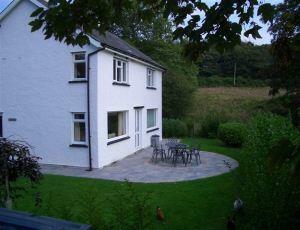 Penmaenbach Farm Cottages01654 791 246work Self-cateringSelf-catering cottages on a working farm. Children are welcome to see farm animals. The owners are a Welsh speaking family who look forward to welcoming visitors to their farm which is part of a farm stewardship scheme. The cottages are conveniently situated between Machynlleth and Aberdyfi, close to the sea & mountains and the many attractions located in the area including the village of Pennal with its rich historical background. The accommodation is in three well equipped cottages. Open fires, TV, Video, & DVD players in all cottages. Electricity, Oil central heating,bed linen and towels are included in the rental price. Guests need to supply their own cot bedding. Cot & highchair are available by arrangement. On arrival guests are greeted with a tea tray with homemade Welsh Cakes and all beds are made up. An outbuilding has been converted to a laundry, (with coin operated machines) and games room with a pool table. Pets - As we have our own farm animals we very much regret that pets cannot be accepted. Self-catering cottages on a working farm. Children are welcome to see farm animals. The owners are a Welsh speaking family who look forward to welcoming visitors to their farm which is part of a farm stewardship scheme. The cottages are conveniently situated between Machynlleth and Aberdyfi, close to the sea & mountains and the many attractions located in the area including the village of Pennal with its rich historical background. Turn off the A493 at Cwrt, between Machynlleth and Aberdyfi. Keep right. Penmaenbach Farm is the first farm on right. Access statement for Stable Cottage at Penmaenbach OS Number SN687992 Penmaenbach is 4 miles away from the nearest train station and half a mile from the nearest bus stop. Stable cottage was converted 12 years ago is a stone building and has kept many of its original features. Main door opens straight into lounge area with open plan kitchen and ground floor double bedded room. Our ground floor double bedded room has an en-suite shower room wheel in shower and transfer space with wash basin& toilet. Hand rails in shower and next to toilet. Mobile phone network - Orange and O2 work here (vodaphone has limited coverage) Car parking space right outside. Remote control TV and video recorder. The remainder of the accommodation has two bedrooms and a bathroom on the first floor accessed via wide wooden staircase. Two of the bedrooms have one wall exposed in the original Stonework. Access statement foe Keeper's cottage at Penmaenbach OS Number SN687992 Penmaenbach is 4 mile away from the nearest train station and half a mile from the nearest bus stop. Keeper's cottage is a 17th Century building with oak beams and low door height Main door opens into small hallway with the downstairs bathroom in front of you. The bathroom has a double shower and a separate bath. You access the kitchen from the hallway and the lounge/dinning room on from the kitchen. The lounge has an open fire place with wooden surround. You go upstairs via steep steps (we have a hand rail) into a double bedded room and through this room into a twin bedroom. The sloping ceiling and very old door gives the place great character. We have an enclosed patio area with seating and have access from the kitchen. Car parking space right outside. Mobile phone network- Orange and O2 work here (vodaphone has limited coverage) Remote control TV and video recorder. Access statement for Farmhouse at Penmaenbach OS Number SN687992 Penmaenbach is 4 miles away from the nearest train station and half a mile from the nearest bus stop. The farmhouse was built in the 1960's is a very light house with spacious rooms. It's situated in its own enclosed garden with plenty of space and a patio seating area. Main door opens into a kitchen dinning area a corridor leads on with a lounge area and a downstairs single bedroom having access from it. You go upstairs where you will find a further double, twin and single rooms.. We have stair gates at the top and bottom of the stairs. The bathroom is on the first floor with shower over bath. Mobile phone network-Orange and O2 work here (vodaphone has limited coverage). Car parking on the farm yard. Remote control TV and video recorder.